The Bureau of Customs has issued Customs Administrative Order (CAO) No. 06-2016, which covers the provisions of Republic Act No. 10863 (or the Customs Modernization and Tariff Act) on conditionally tax and/or duty–exempt importation of personal and household effects of “Returning Residents" and Returning Overseas Filipino Workers (OFWs). The said CAO was published in the Official Gazette on 9 January and will take effect 15 days days after its publication, or on 24 January. A. Who can avail of this privilege? 1. "Returning Resident" – a Filipino national, including his/her spouse and dependent children, who has stayed abroad for a period of at least 6 months and is returning to the Philippines. 2. Returning Overseas Filipino Worker (OFW) – holder of a valid passport issued by the Department of Foreign Affairs (DFA) and certified by Department of Labor and Employment (DOLE) or Philippine Overseas Employment Administration (POEA) for overseas employment purposes. 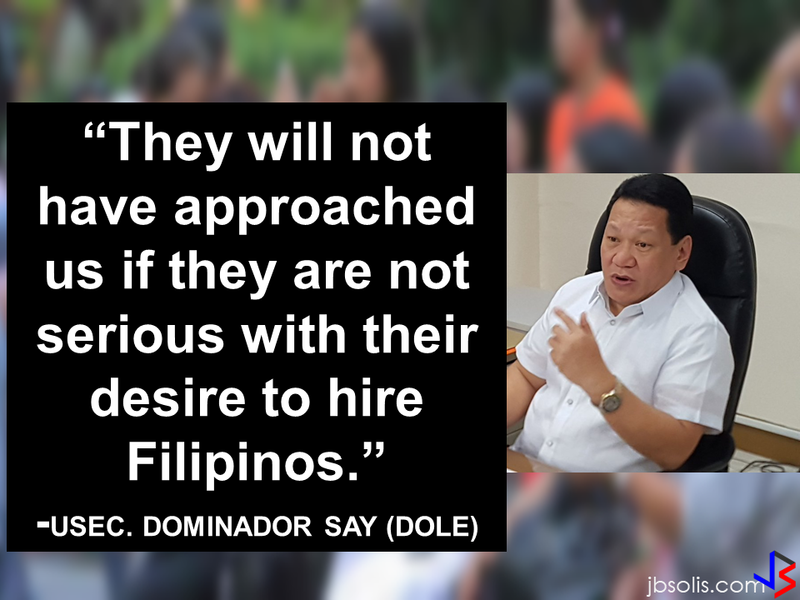 This covers all Filipinos working in a foreign country under employment contracts, regardless of their professions, skills or employment status. To avail of this privilege, the personal and household goods must accompany the Returning Residents or Returning OFWs upon their return from abroad or must arrive within a reasonable time, which shall not exceed sixty (60) days after the owner’s return. B. What are the beneficiaries allowed to bring in? 2. “Durables” such as household appliances, machinery, or sports equipment that may be used repeatedly or continuously over a period of a year or more, assuming a normal or average rate of physical usage. Note: Household appliances, jewelry, precious stones, and other goods of luxury that were previously exported from the Philippines are also exempt from the payment of duties and taxes if these are covered by a Certificate of Identification (CI) that was issued by an authorized Customs Officer before these goods were brought out or exported from the Philippines. Excisable items such as, but not limited to, distilled spirits, wines, cigars and cigarettes, perfumes, toilet waters, in excess of the allowable quantity to be prescribed by the Bureau shall be subject to payment of duties, taxes and other charges. C. How to avail of this privilege? 2. Secure a Duty and Tax Free Exemption Certificate (TEC) from the Revenue Office of the Department of Finance (DOF). 3. P150,000.00 for those who have stayed in a foreign country for a period of less than five (5) years and have not availed for this privilege within six (6) months prior to the Returning Resident's or OFW's arrival. 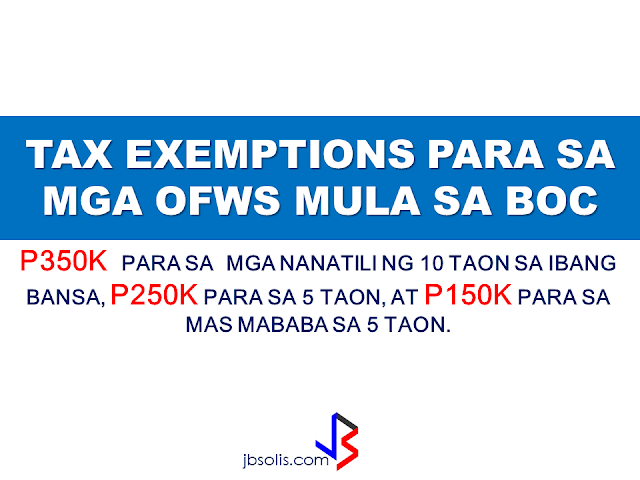 In addition to the privilege stated above, Returning OFWs are allowed to bring in, tax and duty-free, home appliances and other durables limited to one (1) of a kind, the total amount of which shall NOT exceed P150,000.00. Any amount in excess shall be subject to corresponding duties and taxes. 10. Prohibited and restricted goods.